It's the morning of August 14, and I am tired. Marlie kept me up the night before doing acrobatics in the womb. As I sat at the dining table with my mother-in-law, I remember thinking today would be a bad day to go into labor because I was so tired. My MIL suggests I go take a nap and I agree, but first I have an urge to dance! I go into the family room and turn on the Hip Hop channel on the TV. Eve's I Gotta Man is playing and I start droppin' it like it's hot! Afterward, I turn to go upstairs when I feel a wetness, then a trickle run down my left leg. I call out to my MIL, "I think my water is breaking!" She feels my leg and confirms it. I go into project management mode. I call the birth center and I am told to get ready and call in an hour with an update. I tell my MIL to call her son while I go shower and get ready. Today is labor day! I shower and dress in the nightgown that I bought especially for today. It is lime green and looks like a summer dress. I go back downstairs and ask my MIL if she reached Damon. "No," is her reply. No?! "I called him ten times and he's not answering his cell phone," she says. I don't panic because I remember that we agreed that I would text him when it was time in case he was in a meeting and couldn't have his ringer on or answer his phone. I send a text. We sit and wait for him to call. Minutes creep by with no response so I call his desk...no answer. Okay, I am getting pissed. I go into the next room so my MIL doesn't see my frustration (she is a worrier like me). She follows me into the room and I can tell something isn't right when I look at her. Her right eye is all red and watery. She got so anxious that her blood pressure elevated, and she blew a blood vessel in her eye! I realize that the two us could wind up and the hospital if I don't act fast. I call the operator at my husband's company and explain the situation. They transfer me to security. I tell the nice man that my husband works there, I am in labor, and I can't reach him. He laughs and tells me he is on the case. I feel better already. Ten minutes later Damon calls. He is already in the car. I hold back the blue streak of curse words I had prepared to shout and just tell to drive safely. This is my first birth, so I know we have time, plus I need to stay calm and relaxed. By the time Damon gets home, it's been and hour and a half since my water started to break. It continues to come in squirts and my contractions are far apart and mild. I call the birthing center to give an update. 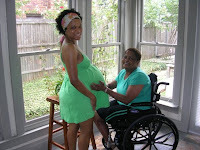 The midwife can tell that I am still in the very early stages of labor because I am so perky. She suggests I go walk for an hour and call back. Meanwhile, Damon is running around the house. I ask him what he is doing. He is searching for his cell phone, which he finally finds in the car! I also let this blunder slide because I am in the zone. We go outside to walk around the block, but come back after a few minutes due to the intense Texas heat. We decide to drive to Target near the birthing center to walk. After an hour, I am bored and even more tired. We head to Whole Foods hoping to benefit from air conditioning and free samples. Thirty minutes later I am ready to get this show on the road. We call the midwife who tells us to come in for me to get examined. We arrive a little after 4 pm and I am just 4 cm dilated. We must get labor progressing, so I start walking a circuit around the first floor and do pelvic squats every five laps for the next hour and a half. It works! The contractions are stronger and closer together. I have reached active labor! I have been internally debating whether or not to share this entry from my personal journal on this blog. I finally decided to post it when I realized my hesitation was caused by my sense of pride, not a need for privacy. So here goes...I had a mini-nervous breakdown on Sunday. 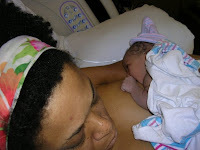 I thought I was juggling the seemingly endless duties of being a new mommy really well. I was managing feedings, changing and laundering cloth diapers, and keeping up with my to-do list (order birth announcements, check!). I even took the 7-day postpartum depression self-test and passed with flying colors. I was Superwoman...not! By Sunday, the adrenaline rush was wearing off and I was running on fumes. But I continued to push myself. I was in the kitchen making a late breakfast and talking about the things I needed to get done that day. Damon replied I needed to slow down and get more rest since I just gave birth a week ago. Of course I interpret this as criticism. How dare he question my super powers?! I argue that I can handle everything I need to do. He insists that I need to focus on taking care of myself and the baby. That was the match that lit the fire. I know he is right, but I still feel like a bad mommy. I start to cry. He tries to hug me. I push him away and race upstairs. I slam the bedroom door behind me and fling myself on the bed and cry it out for ten minutes. Damon enters the room and we talk. We don't see eye-to-eye because I am a doer and he is an idler. Still, I agree to start letting some things go and he agrees to take care of some of these things so I can relax. I have always been a pro at multitasking, but a baby changes everything. She doesn't conform to schedules or checklists. Also, I am human with mortal limitations. So I am prioritizing now...blogging only every other day, returning emails when I have time, letting the phone calls from well wishers go to voicemail, stopping to take a compulsory nap during the day. I am getting way behind on my to-do list, but learning to be okay with it. There was no question that I'd breastfeed. My mother breastfed all six of her children, so I grew up knowing that I'd follow in this tradition. I just survived my first week of being a new, breastfeeding mommy, and I ain't gonna lie...it was tough going. First off, I am lucky that Marlie latched on minutes after being born and knew what to do because I was in no shape to help her. I was in such a fog that I couldn't remember my name much less the techniques I learned in the two breastfeeding classes I completed. All I have to say is that nature is amazing because it will compensate for your lack of skill in any life or death situation. An example would be the first time by milk let down in response to her cry. I wasn't sure if she was crying out of hunger, but my body sure let me know! I panicked when I became engorged around day three and couldn't nurse her because my breasts were swollen, hard, and hurt like heck. The battery-operated pump that we had picked up at the last minute was a life-saver when nothing else seemed to work. After expressing enough milk to reduce the pressure, I used Soothies to relieve the pain (thanks for the tip Kelley!). Itzbeen is a handy, easy-to-use, pocket gadget that keeps a digital record of feedings, number of diaper changes, etc... It was a very useful during the first three days when I was lost in the fog of afterbirth. Around day five my own biological timer kicked in, I stopped using the Itzbeen and watched for Marlie's hunger cues instead. I also realized that I could just count her soiled cloth diapers to make sure she was making enough pee-pee and bowel movements. I wished someone had warned me that breastfeeding is a pain in the neck (and back)! I am going to need a deep tissue massage from craning my neck and holding her while she nurses. I have a breastfeeding pillow, but I have decided that it is more useful as a neck brace, LOL! Breastfeeding resources (books, support groups and web sites). I was of the mindset that breastfeeding would be easy. Was I ever more wrong?! I have re-read the books and notes from the classes, put the lactation consultant's business card on the fridge, bookmarked kellymom.com (another helpful Kelley tip), and made plans to attend the next local La Leche League meeting. These sources of information calmed my fears and gave me the confidence to stick with it. The best advice I have to share with new mommies who are breastfeeding is to trust your instincts. We are equipped to take of our young and we just need to believe in our abilities. I don't mean to brag, but she is so perfect! What did I do to deserve her? Who does she look like? Ask five people, and you'll get five different answers. In my opinion, she is a combination of the both of us. 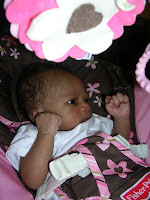 I think she looks like me in the brow, eyes, and nose area. She has her daddy's ears, chin, and mouth. I can't love her any harder. My soul is going to burst. It's scary to be so attached to someone. She is developing so rapidly! Her eyes stay open longer and she scans her surroundings. I can tell she is starting to focus. She is also trying to hold her head up and roll over already. She is a super-hero! I admit that I check her breathing when she is asleep. I can see personality traits in her that she gets from me, like how she always has her right hand balled up under her chin or by the side of her head (see photo). I do that! She sleeps like me too, HARD...nothing wakes her up, not banging doors or a barking dog. She is also an incremental eater like me, she nurses in small portions throughout the day. When I am feeling sleep deprived, just looking at her wakes me up. I can't look at her with tired eyes. Burping is my Achille's Heel. I just can't get her to burp! Her daddy, however, is a pro. I actually was away from her for the first time yesterday and survived! A couple in our neighborhood threw a going away party for another couple. I wasn't going to go at first, but I was getting stir crazy being in the house all day. I remembered someone telling me that I had to take care of me in order to take care of her. So I went to the party for an hour. It wasn't so bad. I got to socialize and wish our neighbors good luck on their move to a new city. Of course I ran straight to her the second we go home! Your daddy and me have been waiting for you for nine, long months! I have loved you since December 19, 2008 when we found out I was pregnant with you. I knew all along that you'd be a girl, and my hunch was confirmed by the ultrasound technician at 21 weeks. At that moment, I realized that raising a daughter was going to be a roller coaster ride...scary and fun! I don't have the best role models for mother-daughter relationships in my family. My grandmother was estranged from her mother, my mother's relationship with her mother is strained, and I hate to say that my mother and me are no longer close as we used to be. I don't know why this happens, but I promise you that we are going to break the cycle. Being pregnant with you has given me the strength to let go of the emotional baggage I was carrying around. You taught me more about faith, hope and love in the nine months that I carried you than I could have ever hoped to learn in my lifetime. I had wall erected around my heart that few people got around, and you came along and smashed it to bits. For the first time, I feel ready to take on the emotional and spiritual responsibility of being a parent. God chose me to be your mother and entrusted me with your life on Earth. My job as your mother is to raise you to become the best woman you can be and to give you the tools to accomplish this. I look forward to watching you blossom. My only expectation is that you value the life God gave you and live it to the fullest. I promise to stand by you on whatever path you choose to walk as long as you are happy. I am not perfect, baby girl...I am going to make mistakes in the parenting department, but I will learn from them. You are going to misbehave and get punished, but you will learn to make better choices. I am not going to approve of some of your choices, but I won't judge you. You are not going to always want or take my advice, but you won't ever have to worry that I will stop listening. We are going to work each others last nerve and we won't always like each other, but we will never stop loving each other. This I promise. I also pledge to always keep the lines of communication open, to always tell you the truth, to value your opinion when we disagree, to never give up on you even when you push me away, and to love you unconditionally. I am so blessed to be your mommy! Hello, I'm Teresha! I just launched Marlie and Me to continue chronicling my journey into motherhood. I am a new mommy (a SAHM trying to figure out how to become a WAHM) and a blank slate. 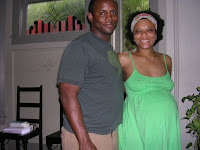 I started actively blogging in January of 2009 to keep family and friends updated on my pregnancy. You can check it out at Jamaican Bun in the Oven. I honestly tripped into the mommy realm of the blogosphere, but it was a fortunate stumble. People, other than my mother-in-law, started reading my blog, liked what they saw, and kept coming back. Respectively, I have learned so much from the many great women (and men) I have met online through blogging. I want to keep it going and contribute my own thoughts, opinions and advice to the mommy blogging community. Marlie and Me is a forum to share my experiences in new motherhood as I navigate baby gear, breastfeeding, cloth diapering and parenting with the objective of delivering education, resources, and a good dose of humor to my readership. I think the tag line says it all...living, laughing, loving, learning. One area that I am developing on my blog is a section dedicated to reviews. I want to spread the word about which products and services are the best for children and mothers through written reviews and giveaways. I am looking to build relationships with companies, big and small, that offer products that help make raising 21st century families easier on parents while helping them live better lives. If you are a PR professional that has stopped by my site, I would love to talk to you about your company or product. Please feel free to email me at t_freckleton@yahoo.com. My interests are in holistic health and nutrition, family-oriented birth, parenting, education and youth development, organic foods and products, environmental issues, community service, news and media, technology and electronic media, entrepreneurship and business development, fashion, entertainment and pop culture, and arts and literature, bargain hunting and discount shopping. I have an educational background in journalism, photography, counseling, and nonprofit management. Before becoming a stay-at-home mom, I worked for more than 10 years in youth development, philanthropy and social enterprise. I have experience in creative writing, branding, community relations and social marketing. A special thanks to Adrienne at Adrienne's House and Tara at Feels Like Home for this opportunity to connect with PR!